Liz McColgan (nee Lynch) is possibly Scotland’s best ever distance runner using any criteria that you care to choose – times run, titles won, whatever. She was born on 24th May, 1964 in Dundee and took up running at the age of 11 when she was picked for the school cross country team. She quickly joined Dundee Hawkhill Harriers where she was coached by Harry Bennett and was recognised as one of the best in her age group. But athletics is full of ‘might have beens’, talented young athletes who ‘could have’ done great things. Trouble is that many were badly advised, many were pushed too hard by relatives and many of them were just unrealistic about their talents and what it would take to develop them. Well, Liz was well looked after by her family and by Harry but one of the personality traits that was to stand her in good stead throughout her own career was that she was always realistic about what could be done and what route had to be taken to get there. Before we go on to the story of her running career, let’s have a look at her personal best times. I quote Doug Gillon on the blog at www.scotstats.net where he writes of her greatest race. Talking of the difficulty she had picking the race he said: “There was plenty to consider: back-to-back Commonwealth Games 10000 metres gold medals; three world records at 10000 metres on the road; a world half marathon title in world record time; world records on the road and indoors. Numerous Scottish British and Commonwealth records. There was the time in Budapest when she smashed Zola Budd’s world indoor 3000 metres records only to be beaten on the line by Elly van Hulst who had been towed in the Scot’s wake all the way. There was the time the roars of the crowd drowned the stealthy approach of Joyce Chepchumba who stole past to deny her a successful London Marathon defence by a single second in what was the tightest finish ever. That was in 1997, a year after McColgan had ensured financial security for life over the same Kenyan. There was the …..” But you get the picture, I don’t need to go on. I would urge you to go to the scotstats website and read the entire article. Many a successful athlete would have packed the spikes after such a career and gone on their way leaving a wonderful tradition for others to follow. But Liz wasn’t finished with athletics. She went back to Dundee and to the Hawks and started coaching. Not doing what many TV pundits do and ‘polish’ someone else’s athletes – :Linford Christie famously said “I’m not the kind of coach who goes down to the track side in winter and works on the sessions.” Liz is. This is so well known that the Power of Ten website (www.thepowerof10.info) lists the athletes that she was coaching at the time it was set up! Why is she doing it – apart from the fact that, like all serious coaches, she enjoys it? There might be a clue in an article in the Los Angeles Times of April 12th 1987. In an article there it says: “Liz believes that coming from the sporting backwater of the north east of Scotland has been her major obstacle. “In Dundee we probably have one major track meet a year, whereas in London, for example, there are several to choose from,” she said. “I have spent hours on the phone trying to get races. People think of me as a marathon runner but I can go down to 800’s and 1500’s..” Huddled in gloves, scarf and waterproof jogging suit in rain-lashed Dundee, Lynch said that in Alabama we run in shorts every day. We never had to put track suits on.” So when it comes to knowing the difficulties that talented local youth face, she knows whereof she speaks. Liz was more than a runner and is still doing sterling work for the sport in Scotland. Simply type her name into a search engine and the internet will produce a wealth of information about Scotland’s most successful female athlete. The UK Athletics Hall of Fame Profile is particularly good and is printed here. Two interviews will also be referred to: one for runbritain.com and one for Dundee University’s on-line magazine ‘The Bridge’. First the UKA Profile. Date of Birth: 24th March, 1964. Coached by: Harry Bennett/John Anderson. The brilliant career of Liz McColgan can be broken up into three parts: Her glory at the Commonwealth Games in her own country; her superb World Championships in Tokyo; and her ability then to adapt that track technique to the roads. All three of them were memorable because of the drama McColgan brought to events and her refusal to allow anyone to pass her on the way to gold. As Liz Lynch she won the Commonwealth 10000 metres title in Edinburgh amid amazing patriotic scenes; in 1991 her amazing front-running performance to win the world 10000 metres title was mesmerising; and then she transferred that ability to making a record-breaking marathon debut. When she was at her peak she was unstoppable. When the Commonwealth Games returned to Edinburgh, 16 years after the Scottish capital had last staged them, one of the new events was the women’s 10000 metres. It was a stage ready-made for a Dundee Hawkhill athlete who had made her first steps to world class while at the University of Alabama for whom she won the NCAA indoor Mile that same year. While the weather had been typically Scottish for the championships, rain and gloomy conditions never being too far away, Lynch brought rick emotion to the occasion with a tremendous and emphatic victory. What made her stand out, and it remained such a glorious trait throughout her career, was this bloody-mindedness to dominate races just how she wanted. If the rest of the field wanted to follow, then they knew they would be in for a tough afternoon, as the Commonwealth’s best women long distance runners discovered. Cheered on by a packed crowd at Meadowbank Stadium with the blue and white flag of Scotland turning the event into a spectacularly colourful occasion. Lynch ran to victory in 31:41:42, a British record and a triumph by nearly 12 seconds, with Anne Audain of New Zealand second in 31:53:31. It was was the first of four times that McColgan would break the British record for this distance, and the lap of honour was something to behold, as Scotland celebrated their only gold medal winner of the Games. She was second in the World Cross Country Championships in 1987 and smashed her best at all events from 800 to 10000 metres, in which she was fifth at the World Championships in Rome in 31:19.82. Further British records at 10 K came with 31:06.99 in 1988, and 30:57.07 in 1991. In 1987 she married Irish International Peter McColgan and twelve months later, after a hugely successful campaign on the roads, she took the Olympic silver medal at 10000 metres in Seoul in 31:08:44 as Olga Bondarenko of Russia won in 31:05.21. She showed her strength once again in 1989 setting a world 10K road best of 30:38 at Orlando, just a week after winning world indoor silver at 3000 metres in Budapest having led nearly all the way, then returning to finish sixth at 1500 metres just 13 minutes later. In 1990 in Victoria, she retained her Commonwealth 10000 metres crown in 32:23.56. She was also third in the 3000 metres but her best was yet to come. On November 25th, 1990, McColgan gave birth to her first child, Eilish, but by March of 1991 she was fit enough not only to compete at the World Cross Country Championships in Antwerp, but finish third, showing no signs that motherhood affecting her physical build or mental aggression. It is believed that having children can actually help the make-up of an athlete, the body’s reaction providing even more substance, and on a steamy night in Tokyo at the World Championships in August, McColgan proved that theory totally correct. “It was the greatest performance by a British distance runner,” said Brendan Foster, the Olympic 10000 metre bronze medallist from 1976, and now a BBC television commentator. His words were providing a backdrop to the pictures of McColgan systematically taking apart the field in the final of the 10000 metres, with an astonishing front running display which took her to the gold medal. McColgan destroyed her rivals from the start, including defending champion the brilliant Ingrid Kristiansen of Norway, as she ran the first kilometre in 3:02.95. The pace barely relented and McColgan, ignoring the tremendous humidity, won in 31:14.31 from China’s Zhong Huandi in 31:35.08 with her team mate Wang Xiuting third in 31:35.99. While that pair had a race of their own, McColgan was in a class of her own and her performance won her the BBC Sports Personality of the Year award. It was an honour at the end of a year when after Tokyo she won the New York in the fastest ever debut time of 2:27:32. A bold new step and one which would signal the final part of her career. The marathon was her long-term aim, but first she was determined to win the Olympic title over 10000 metres but it was not to be. In Barcelona in 1992 she was fifth, unable to break the field this time in a year when she broke the world indoor 5000 metres with a time of 15:03.17. 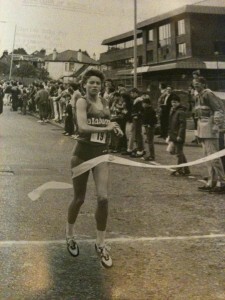 But she returned to Tokyo to win their marathon in 2:27:38 and finished third in the Flora London Marathon in 1993. She was injured for that summer and by 1995 she had been told that she might never run again as the toil on her body looked like taking its toll, having suffered with pains in her back, her knee and her foot, but her doctors probably didn’t realise who they were dealing with: this was Liz McColgan. In soaring heat in 1996 she won the Flora London Marathon and BUPA Great North Run, but again she was left disappointed at the Olympics. McColgan had chosen the marathon but just days before, while preparing at her base in Florida, she suffered an insect bite. The poison entered her system and she was never herself, finishing sixteenth in the Games in Atlanta. In 1997 she was so close to successfully defending her London Marathon title, losing by one second to Kenya’s Joyce Chepchumba who took victory with virtually the final step of a memorable race. But McColgan’s time of 2:26:52 was a personal best and twelve months later she was second in London again. After ‘retiring’ in 2001, due to a series of stress fractures she made a comeback and in 2004 she won the Scottish Cross Country and indoor titles before finally bowing out in April that year. Liz has been involved in coaching since she stopped competing herself and has worked with many very good athletes. The interviews state that she started running at 12 years old, in her first year at secondary school. Her PE teacher spotted her talent and she joined her local club. She loved running longer distances from the start and never seemed to tire as much as others in her group. She did not consider herself the most talented; but began to train much harder than the rest. By the age of 19 she had won her first UK title. Philosophically and wisely, she says, “Running is full of disappointments; they far outweigh the better performances.” To the age of 17 she was coached by Harry Bennett. After his death she self-coached to win the 1986 Commonwealth title when she was 22. She met John Anderson after the Games and he coached her for 18 months. She then coached herself to the World 10,000 metres title, and London Tokyo and New York marathon wins. Then she met Grete Waitz who coached her from 1992 – 1996. 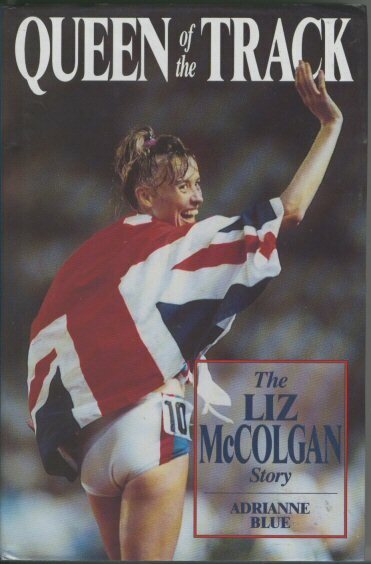 Liz’s book – well worth reading as it gives a bit of insight into her as a person and about her career. Scotland was fortunate to have two real giants of women’s endurance running in action at the same time. Liz was only six months older than Yvonne Murray and their distances were almost identical with Yvonne tending towards the 1500, 3000, 5000 metres end of the scale with Liz eventually specialising in 10000 and the marathon. There were some notable tendencies – Liz always ran what Brendan Foster would call ‘a true run race’; in other words she would always go out and do her best running and regardless of what the opposition was doing. Always focused she was a redoubtable competitor whereas Yvonne spoke about ‘tactics’, read up on her opponents and their weaknesses and used that knowledge to help win races. Both are perfectly acceptable ways of running. As an indication of how they liked to run and of Liz’s character I will look at two races. In 1991 they met up in a specially organised race in Duthie Park in Aberdeen and although there was no one close to them, Liz ran a hard race all the way to the end – well as hard as she was allowed – Yvonne was right up on her shoulder, crowding her, jostling her all the way to the finishing straight where she won the sprint finish. I was actually shouting at the TV because of the amount of physical contact involved. The following year they were representing Britain against Kenya and they were in the same event – the 3000 metres. There was a lot of talk about it being a ‘grudge match’ Well it didn’t turn out quite like that – with two Kenyans to beat, Liz quickly went to the front, Yvonne settled in on her shoulder keeping the opposition back, there was no jostling, it was not one against the other but looked more like a team race – and usually it was the Kenyans who ran as a team! 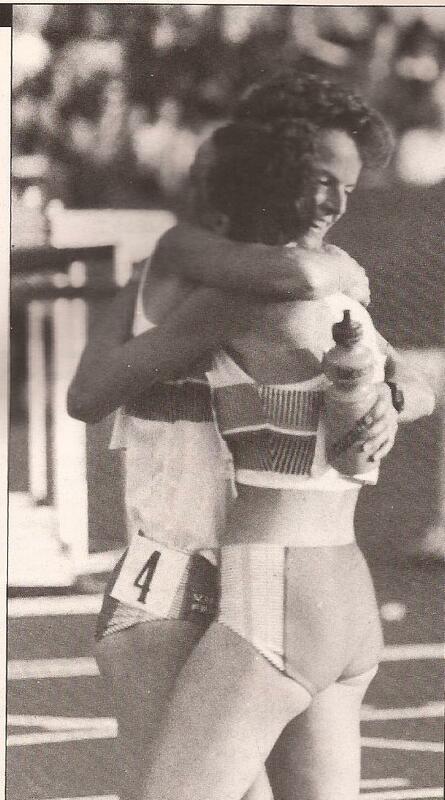 Then with 300 to go, Yvonne produced ‘one of her famous kicks to win in 8:36.63.’ Emphasising that they still felt that they were firm friends – whatever certain elements of the Press would have you believe – the two doyens of Scottish athletics then embraced and embarked on a lap of honour together. 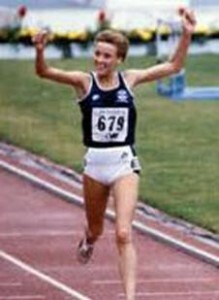 the mood was apparently so pleasant that McColgan even found time to joke about her defeat (although 8:41.07 over 3000m for a woman whose sights are set on the 1000m is hardly something to be ashamed of) ‘Liz said to me during our lap of honour that she made a good pacemaker for me,’ a jovial Murray revealed to the assembled Press.’ The quotes are from a report on ‘Scotland’s Runner’ of August 1992. The accompanying picture is below as proof. Genuine rivals over a long period, never afraid to race each other and no grudges held! At a marathon seminar at the Inchyra Grange in Grangemouth on Wednesday 25th August, 2010, Don Macgregor said, in reply to a question that in his opinion the greatest Scottish marathon runner was either Liz McColgan or Donald MacNab Robertson (six times UK Marathon Champion, first Scottish marathon champion, double Olympian, etc. It is a compliment to either to be compared to the other – I think however that my money is on Liz! There are several videos of her in action at the youtube website – just type in ‘liz mccolgan’ and take your pick of what’s there. Meanwhile her daughter Eilish, coached by her Mum is a regular member of the GB team with appearances in several major Games to her credit – eg 2008 Commonwealth Youth Games 1500m and 3000m; 2011 European U23 Championships3000m steeplechase and Spar European Team Championships 3000m steeplechase; 2012 Olympic Games 3000m steeplechase, and 2013 IAAF World Championships 3000m steeplechase.